The project students want to ask who they are ? etwinning Do you recognize me ? I am a boy. I wear glasses.My name is Baturalp.Who am I ? I am a girl and I am in the middle at the back row. I love artichoke. I am Kader,aren't I ? My name is Simay. I am standing next to the teacher. I have got long straight blonde hair.My favorite food is kiwi. Hello ! I am Betul. I have got long straight fair hair and I love smiling.My healthy food is walnut. Do you think I love smiling ? Do you think my healthy food is walnut ? 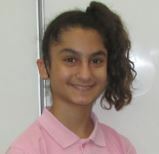 She likes pony tail .She's got long wavy hair.Her name is Zehra and she likes English. Do you think that this is Zehra ? Do you agree that this is Zehra ? I often eat meat , but I never put on weight.I am slim and I've got a pony tail. Who am I ? I am Akif. My hair is shorter than Emre. My favorite superfood is grapefruit.Don't eat grapefruit while taking medicine! Are you sure that I am Akif ? Believe me,please ! I am Akif. 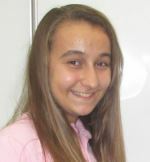 I am the tallest girl in the project.My favorite superfood is broccoli and my name is Emine. Don't believe her ! She is telling a lie. I like broccoli. I never wear glasses. I like quince and my name is Ilayda. I like winter fruits. I don't like summer fruits. I hate summer fruits. My favorites are winter ones. I am the second girl in front of the door and my name is Hacer.An apple a day keeps the doctor away! Am I Hacer or Melisa ? Am I Melisa or Hacer ? My name is Yunus and it means "dolphin" in English.My favorite food is watermelon.I am the first boy in front of the door. My favorite food isn't watermelon. My favorite colours are red , black and green. I have got long dark hair and big brown eyes.I love eating nuts and I am Bengu. Am I Bengu or not ? Am I Bengu or Simay ? I have got dark fringe and my name is Emre. I am forgetful and I like eating cauliflower. My name means September and I am Eylul.I am the only girl who wears glasses.I prefer eating turnip to carrot. Don't believe her. She doesn't like September ,but I do. I would like to eat grapes.My name is Melisa and I hate red. I am Melisa. I want you to believe me. I am Melisa. I want you not to believe her. I am Meric.I am new in this school.I am the second boy on the right. I often eat carrots. It's the first time I've been participating an etwinning project . I have participated in many projects in this school. Do you like popping corns? I do and my name is Oyku.I have got straight fair hair. I have never eaten popcorns. I have eaten popcorns before . 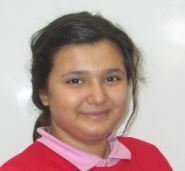 She is Miray.She has got a smiling face.Her favorite fruit is dried fig. Emine likes broccoli,but I don't. I prefer fig . Emine doesn't like fig.She likes broccoli. I love strawberry and vitamin C. I am the only girl who has got short straight hair. Am I Ozge or Zehra ?